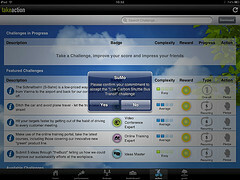 CloudApps recently released SuMo, their sustainability employee engagement app. The name SuMo comes from the words Sustainability Momentum we’re told, and this is because SuMo was designed to maintain the momentum of an organisation’s sustainability initiative. GreenMonk was given a demo account on SuMo so we could take it for a test drive, and it is a cool little app. CloudApps sell a suite of sustainability software products for organisations. Their applications sit on top of Salesforce’s Force.com cloud platform, which allows CloudApps to focus on writing the software, and not have to be concerned with maintaining the server infrastructure which runs their programs. CloudApps solutions already have quite comprehensive capabilities, so it was interesting to see them come out with this employee engagement module. The SuMo application works well on mobile devices and it is designed to foster interest and ongoing enthusiasm for sustainability initiatives amongst an organisation’s workforce. It does this by allowing employees to pledge to participate in a number of challenges supplied by the organisation. 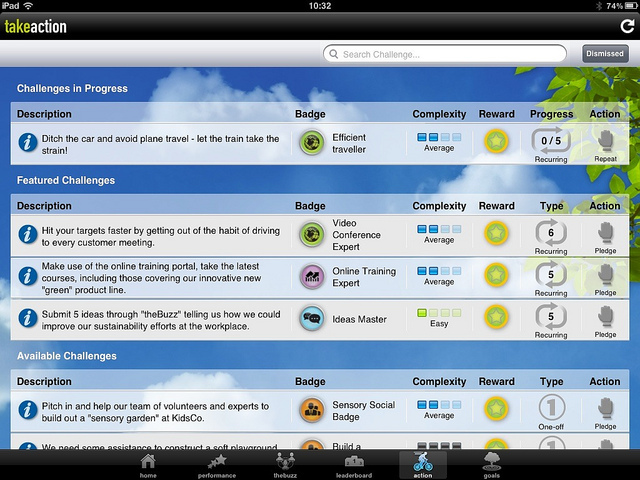 These challenges are categorised, ranked for difficulty and assigned points. As employees carry out these challenges (anything from switching from short haul flights, to teleconferencing for their next meeting, to volunteering at a local charity event), they are assigned points and badges, which determines their position on the Leader Board. Because SuMo sits on Force.com, it can take in data from an organisation’s ERP applications, as well as reporting them back. So initiatives undertaken by employees in SuMo can be reported directly into its back-end systems and the savings accounted for. Also, a nice touch in SuMo is the ability for employees to add new ideas to the site. These ideas can be voted on by colleagues, commented on and favourited. It’s nice to see a bit of social working its way into these kinds of enterprise apps. This will certainly help the app be more engaging and sticky for users. This is something whose importance shouldn’t be underestimated for industries with issues around recruitment and retention. The user interface has a few little quirks (it is not always as intuitive as it could be), and the app needs to become more social (include Share on Twitter, Share on Facebook, etc. buttons) buttons, but presumably that will all come with time. For a version 1.0 app though this is a creditable effort. More and more companies are catching on to the importance of social media in building employee engagement and communicating their social responsibility/sustainability initiatives to the world. In addition to SuMo, there are some other platforms out there to take note of. There’s Scope5, which helps companies track CO2 emissions. AngelPoints gathers metrics for large, Fortune 500 companies. And earthbongo helps companies tell their CSR stories both through metrics and employees’ own words, pictures, and videos. The earthbongo platform also allows for easy sharing on Facebook, Twitter, and other social media.